GM’s corporate strategy of retrenchment and revitalization that we examined in the case at the beginning of this chapter will drive human resource, marketing, operations (production), finance, and other functional politics. GM appears to be resigning itself to a 30 percent market share, at least in the foreseeable future, because it has permanently closed 11 plants instead of using temporary layoffs, the traditional way of dealing with sale falloffs in the auto industry. Thus, GM’s overall corporate retrenchment strategy will have profound effects of its functional strategies, including its human resource strategy. GM has specifically recognized these linkages in the way it established and operates its Saturn Division. 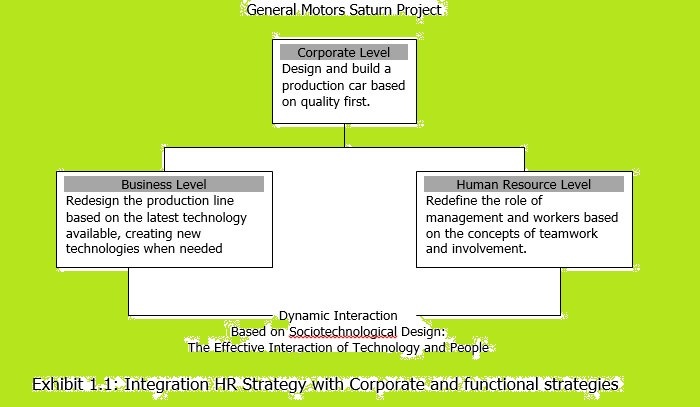 Exhibit 1.1 shows how GM’s Saturn project has been used to link corporate strategies to business strategies and finally to human resource strategies. Example of Corporate, Business, and Human Resource Management Strategy Interrelationship. People in organizations make decisions. Even in automatic decisions, such as an automatic cutoff in a launch sequence for a space rocket, someone programmed a computer to shut down the firing sequence it certain data were present or not present. Automatic or programmed decisions are ultimately people driven, even though in some cases tracing back the sequence to the place where human involvement occurred can be complex. In this section we examine the human resource impact of decisions from four perspectives. First, we look at the issue of the substitutability of capital for labor. Second, we look at the impact of strategic decisions on human resources in general in the organization. Third, we examine the political forces at work in human resources. Finally, we examine the role of the human resources unit in strategic decision making. From a strategic and economic perspective, the underlying decision an organization must make regarding its human resources in its capital-labor ratio. Each organization must decide to what extent it will substitute capital for labor and vice versa. In other words, an organization must decide to what extent it will fill its jobs by substituting machines for people. Since the Industrial Revolution, organizations have substituted capital for labor by using machine power to replace human power. Generally, this has led to higher levels of productivity and lower per unit costs of production. The back-hoe replaced the ditch digger; the automatic glass-blowing machine replaced hand blowers; the high-speed printing press replaced the hand press, and so on. Mass production-changeable parts and specialized machine performing the same function over and over again to produce huge quantities-has allowed for tremendous increases in productivity. Today the same capital and labor decision is being made in factories, offices, and mines around the country, but today it involves substituting smart machines-computers-for other machines and labor. Personal computers replace electric typewriters and calculators in offices; automated management and control systems replace people-controlled machines in paper and steel plants; robots replace welders on automobile assembly lines; automated answering devices replace receptionists who answer telephones and guide people to the right extension; automatic teller machines replace tellers at banks; optical scanners read prices off grocery items replacing clerks who ring up the price-the list goes on and on. Organizations invest in these smart machines because, in general, they do the job more cheaply and efficiently than people do. But these changes do not come without both monetary and human costs. Some people who are laid off may never get a job again. Those who do find work may find much lower-paying jobs. Over people enter retraining programs to learn new skills to operate the smart machines. Still others must move and relocate to cities in parts of the country offering suitable employment. Finally, others may become alienated and drop out of society as a form of rebellion against technology. This technological change brings dislocations, which are the costs of substituting capital for labor. Society as a whole rather than individual firms largely bears these costs, so firms often do not consider them when making a technological decision to automate a job or process. In fact, some firms often have no choice. In order to remain competitive from a cost basis in worldwide markets they must automate, and they do. We saw this during the 1980s in the steel, rubber, auto and a host of other major industries, and we will likely continue to see it as other industries including financial services, insurance, and housing become globalized. The extensive job design consequences of substituting capital for labor by incorporating more technology into jobs are fully explored in later chapters. Choosing the strategy that the company should adopt to maintain or improve its position in the marketplace. Ensuring continued sales growth and maintenance of its workforce to avoid retrenchment and layoff. Adapting to its ever-changing environment. Collecting the information it needs to understand and influence its environment. Determining whether to chance operating environments. If so, to which one? Why? There are three primary factors that influence strategy formulation; competitor actions, environmental opportunities and threats, and an organization’s internal strengths and weaknesses. Strategies are adopted to beat the competition. Competitive actions are anticipated and appropriate strategies adopted. The environment presents threats and opportunities. Strategies are adopted that allow an organization to take advantage of windows of opportunity and to project itself from outside threats. This is discussed further in the next chapter. Finally, a firm’s internal strengths and weaknesses help to drive strategy since a firm wants to take advantage of its strengths and also overcome or correct its weaknesses. Another major influence on the formulation of strategy comes from stakeholders. Stakeholders are groups of people who have a major interest in or claim on the operations or output of the organization. They are also referred to as constituent groups. 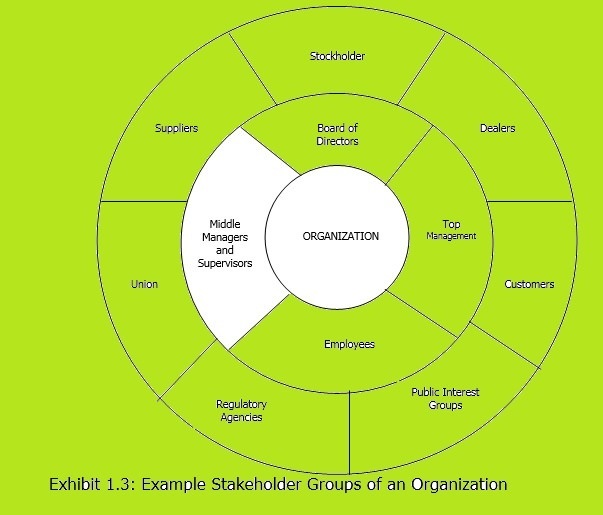 While the specific stakeholder group for a particular organization are unique to that organization, Exhibit 1.3 shows examples of stakeholder groups in an organization and exhibit 1.4 shows some of the stakeholder groups for a human resource unit. Notice that some of an organization’s stakeholders are actual members of the organization; employee, managers, an boards of directors (except for outside board members unless they are also stockholders). However, notice the range of outside groups that can affect the formulation of an organization’s strategy-unions, suppliers, dealers, and government regulatory agencies. Each of these groups lays claims to part of the organization’s output. Employees want more wages and job security; stockholders want more dividends and higher stock prices; customers want quality products and services at the lowest possible price. obviously, an organization cannot possibly satisfy all of these groups completely. Therefore, it bargains, negotiates, and compromises. No group receives maximum returns on its claims from the organization; rather the organization tries to at least minimally satisfy each group. Of course, the claims of some groups sometimes become stronger than others. The Teamsters Union pushes strongly for a wage increase. Ford’s dealers argue for better financing terms. A public interest group from a small Midwestern community storms a corporation’s headquarters to protest the local plant’s relocation to Mexico. A corporate raider tries to buy enough stock to take control of a company. In each of these situations, the organization must decide what its basic position will be and how this position will affect the organization now and in the future. Suppose you are a strategic Human Resource Manager. If you want to integrate HR Strategy with corporate and functional strategy, how many points would you consider? Discuss the points to be considered for integrating HR in the strategic decision. What are the strategic choices to be made for the managers in formulating corporate and HR strategy. Mention the key components of the stakeholders group.